President Ram Nath Kovind today led the country in paying homage to the architect of the Indian Constitution Dr BR Ambedkar on his 128th birth anniversary. Mr Kovind made prayers with flowers as a tribute at the statue of Dr Ambedkar at the Parliament House Lawns in New Delhi today morning. Vice President M Venkaiah Naidu, Prime Minister Narendra Modi, Lok Sabha Speaker Sumitra Mahajan, Social Justice and Empowerment Minister Thawarchand Gehlot, Ministers of State for Social Justice and Empowerment Ramdas Athawale and Vijay Sampla and Minister of State for Parliamentary Affairs Vijay Goel were among the dignitaries who also present at the tribute ceremony to Dr Ambedkar. Vice President M Venkaiah Naidu today remembered Bharat Ratna Dr BR Ambedkar on his Jayanti. In a tweet he mentioned, Mr Naidu said, Dr Ambedkar left an indelible footprint on the sands of contemporary Indian history. He said, a social reformer, legal luminary and an erudite scholar, Dr Ambedkar was a champion of people’s rights. Prime Minister and Lok Sabha Speaker Sumitra Mahanjan today morning also paid floral tributes at the portrait of Dr Ambedkar inside the Parliament House. Dr BR Ambedkar was Born on 14 April 1891 in the town and military cantonment of Mhow (in Maharashtra pre-independence, now in Madhya Pradesh), which is now known as Dr. Ambedkar Nagar now, Dr. Bhim Rao Ambedkar was the 14th and the last child of his parents. His original surname was Ambawadekar, however, it was changed to Ambedkar in school by his teacher. Dr. Babasaheb Bhimrao Ramji Ambedkar was born in the Mahaar caste in Hindu religion. At the age of 14, Dr. B R Ambedkar was married to Ramabai. However, Ramabai Ambedkar on May 27, 1935, after a prolonged illness. She was 37. After her death, Dr. B R Ambedkar married Savita Ambedkar. 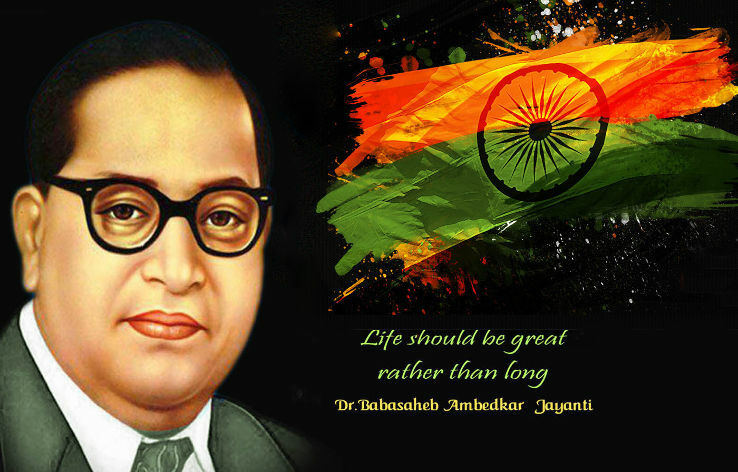 Dr BR Ambedkar fought revolutionary battle against inhuman caste practices against Dalits and inequality among men and women, Dr BR Ambedkar later was converted to Buddhism in 1956. Dr. B R Ambedkar had a mastery in 64 subjects. He had knowledge of at least 9 languages. He completed 8 years of studies in just 2 years 3 months at London School of Economics. He is the first and only person in the world to receive a valuable doctorate degree named “Doctor All Science” from the London School of Economics. Dr. B R Ambedkar has the highest number of statues in the world. In 1950, his first statue was built in Kolhapur city. The credit of giving a place to “Ashok Chakra” on the Indian tricolour goes to Dr. B R Ambedkar. Dr. B R Ambedkar when converted to Buddhism religion, called him “the modern Buddha of this age”. Ambedkar took his last breath on December 6, 1956, in New Delhi.